A Guide to Remarketing PR for Maximum ROI. Once you have run a successful campaign and received positive news coverage, where do you turn? 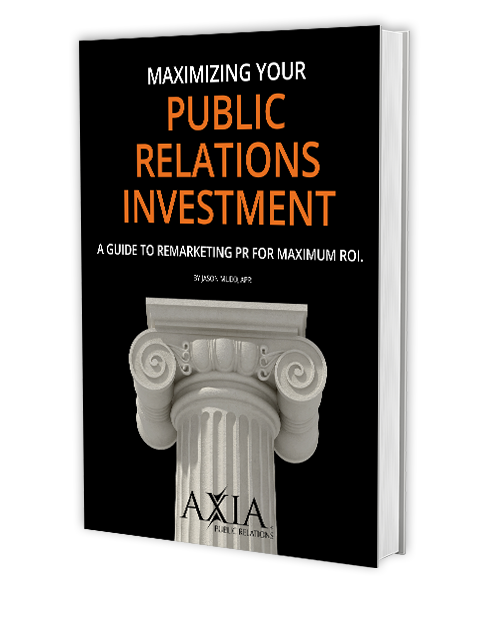 Axia Public Relations provides the guide to maximizing your public relations investment. Once you have run a successful campaign and received positive news coverage, where do you turn? The impact of your investment does not end with the campaign. In this book, Axia gives you the keys to planting seeds, influencing markets and optimizing your media coverage. From company websites and social media to industry blogs and newswires, we will show you how to utilize your investment to get even more exposure.